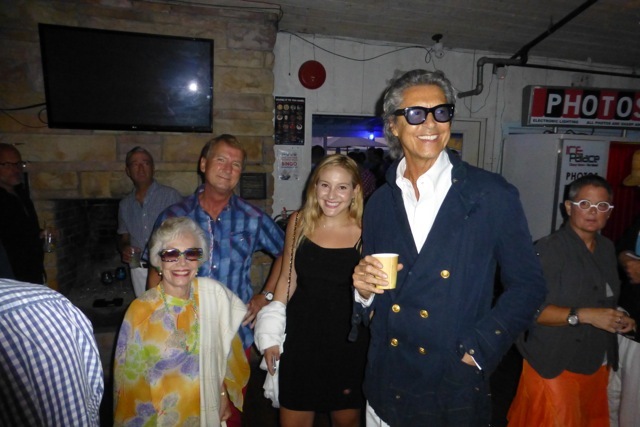 When Tommy Tune brings his tunes and talent to Feinstein’s, San Francisco, Sept 26-28, Carol Channing will be in the audience. She will fly there from her Rancho Mirage home with cousin Sylvia Long. Tommy and Carol always seem to be there for each other….just as Tommy was cheering Carol on during her recent Fire Island gig at the Ice Palace. Being with these two devoted friends was a joy. 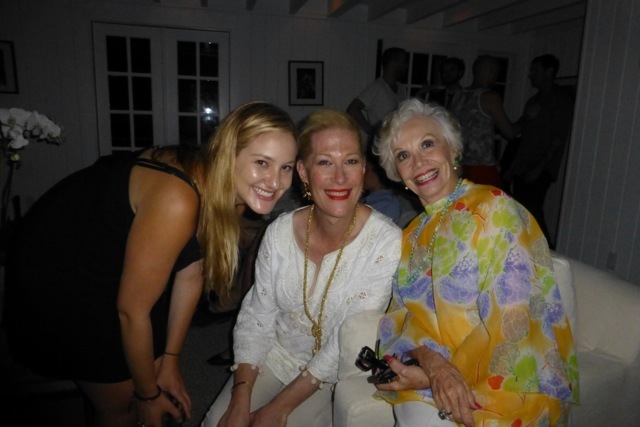 We were all in the same magnificent home in Fire Island. The morning before Carol’s appearance at the Ice Palace, she was awake early wearing checkered pajamas and having her morning Tea. “I have your tea. No coffee for you,” Sylvia answered. Being a star performer takes discipline. And coffee is not in Carol’s best interest. I shook my head in wonder at this giant of the American theatre who had so much fun teasing me. “From now on I am going to call you ‘Little One,’ she said and that is still her name for me. Justin Vivien Bond, scheduled to do the Q & A that evening with Carol, suddenly arrived. They discussed Carol’s career, her start in show business, the songs in dozens of languages that Carol still sings and how she mystified the producer of the first show she ever saw in San Francisco at the age of 6, a Russian musical, by repeating the entire script and score in Russian for him. Justin Vivien asked questions about Carol’s Golden Globe Award for Thoroughly Modern Millie and her memories of Hello Dolly! Tommy, Peter and Wayne joined us in the living room. They shared their excitement, not only about the show but the party at Tommy’s the following night. “So many of your old friends will be there,” Peter remarked. Tommy walked around Carol seated on the couch. He stroked her head as he walked by and sat next to her, “You know you are going to be so good tonight, everyone will love you,” he told his beloved friend. “There will be a roar when you walk on stage and a standing ovation – just to see you,” he encouraged. “Of course” we all chimed in. A make-up man was due soon but Sylvia suggested that Carol take a nap first. Carol nodded in agreement. “Let’s go into the bedroom,” Sylvia urged. “No, I want to stay right here on the couch. I want to hear what you are saying. I will close my eyes but I don’t want to miss anything.” We could tell that Carol was accustomed to getting her way. “She really is a closet intellectual,” Tommy said. Sylvia went into the bedroom and emerged with two outfits for Carol. She held up a white tuxedo and then a black two piece outfit with tight pants and a multi-colored jacket. She looked at Tommy. “Which one do you think Carol should wear?” Tommy chose “The last one.” And so the decision was made. “Soon afterward Carol lay down on the couch. After listening for awhile, she closed her eyes, fell asleep, and we all continued to talk about how wonderful she would be that night. The make-up man arrived from Manhattan. It was a revelation. There wasn’t a detail that Carol missed. “That’s lovely but I need a white pencil here – and a little more shadow there.” She knew exactly what she needed, what had always worked, and would again. The lashes made her eyes enormous and the pretty lady in the pajamas, now in slacks, was once more the glamorous star who had never missed a performance during the 5,000 performances of Hello Dolly! Suddenly a man arrived carrying a huge poster of Hello Dolly! He had tears in his eyes when he was introduced to Carol. He was overcome with emotion. Wayne had made the man’s day. It was also a gentle reminder for Carol that despite passing years, she is still loved by adoring fans. Suddenly Carol had the jitters. “I have a frog in my voice. I won’t be able to talk – to project,” she said. Tommy was sitting outside on a lounge overlooking the pool. Peter came out, “Better talk to Carol,” he said. Tommy went inside and gently held Carol’s hands, “Don’t use such low tones,” he said quietly. “But I have to,” she replied. “My mother made (pause) lemonade” answered Carol and they repeated it several times….over and over again. They gave each other knowing glances because they had both been through it so often. And so off to the Ice Palace Gary, Jerry, Tommy, Wayne, Peter, goddaughter Isabel Kaplan and I went. We walked to the Ice Palace and Carol, Sylvia, and Harlan followed later in a golf cart – the only one in Cherry Grove. The long line to get inside the Ice Palace poured from the street, up a slight hill to the entrance. The show had been sold out for weeks. But still people without tickets tried to get in. There were hundreds of people seated inside. We feared the crowd might be larger than permitted by fire laws. Seats were close to one another and there were signs on our chairs with our names. Big spenders ($100 or more) were in front. We were in the center but almost half-way back. Chairs from all directions faced the stage. Some people were standing and you could feel the anticipation and excitement. Piped music played the scores from Gentlemen Prefer Blonds and Hello Dolly with Carol’s voice echoing throughout the hall. Lights were lowered and three musicians took their places before Justin Vivien Bond, an apparent Fire Island favorite, was introduced. She sang a medley of songs with special lyrics…very funny. The crowd cheered. I feared the late introduction of Channing might disturb Carol. But of course the star is always saved for last. “I won’t get up,” Carol promised. The audience broke into nonstop applause. They stood and cheered as Carol, mindless of her promise, stood and took big bows with hands stretched out as if to embrace the loving crowd. 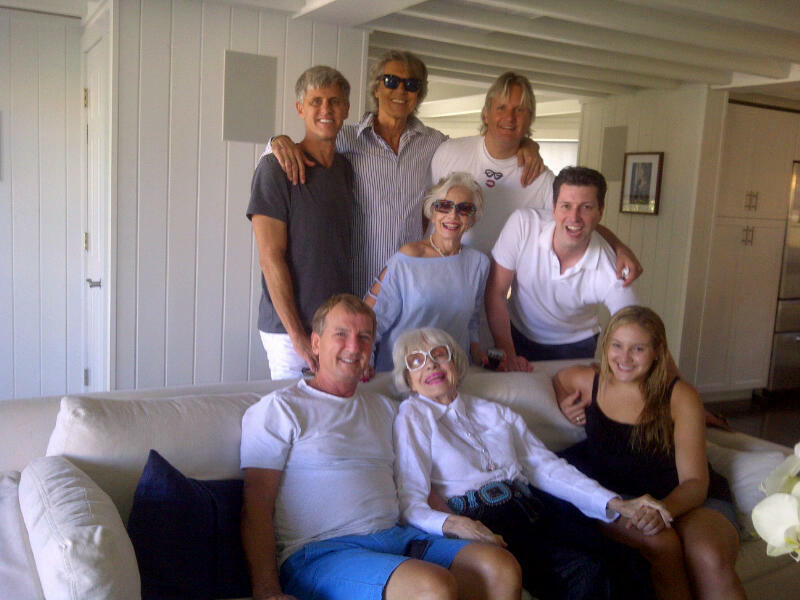 “I love these people,” she had said earlier – and they clearly loved her. She was asked about her first theatre experience. She said that she saved every penny of her 50 cent allowance every week at age six to go to the Curran Theatre. She described the Russian show she had seen and proceeds to sing every role in Russian – the men, the women, the children. She jumped up for emphasis, singing to the audience and to Vivien, sometimes into her ear. She had the audience eating out of her hand and she knew it. She held onto the moment and was greeted over and over with hysterical laughter. When she sat down, she realized that Justin was seated stage right, lower than Carol, so that the star was the center of attention. She looked at her interviewer and said, “Oh thank you, Vivien, for downstaging me.” The audience erupted into loud laughter. Years of experience gave her impeccable timing. She knew just how long to keep the laughter before jumping up again with another funny song – playing to the audience and to Justin Vivien. A question and answer session continued with story after story and laugh after laugh. She did the entire soliloquy – word for word. And then broke into “Before the Parade Passes By” sung to perfection by the lady for whom it was written. There was no band to back her just a loving audience that wanted to be in her parade. There were not only more cheers but some tears from a loving audience that realized this lady will never let the parade pass her by and they were fortunate to share in the glory of the evening. After a multitude of thank yous to the audience and to Vivien the entire audience sang a rousing, thrilling “Hello Dolly” to the actress who has brought them so much pleasure over the years. Carol stood (yes, again!) and waved, and blew kisses as the cheers continued. The accolades for Carol continued. There were representatives from the New York Times, New York Post, Wall Street Journal and their photographers. They surrounded her after the show and some of the photographers came back to the house. Sylvia finally dismissed them so Carol could relax with her first glass of wine in three weeks. “Ah, Pinot Grigio! I have been waiting for this,” Carol said. Justin Vivien, band members, and friends of the producer came back to the house for an after show celebration that continued long after Carol and Sylvia had gone to bed. With the house packed with guests, I finally decided to go to bed. The chatter and laughter continued for awhile and suddenly there was complete quiet. I went down stairs and, except for Carol, Sylvia and me – the house was empty. The next day Peter told me that everyone had gone out for pizza. It was the only way they could get rid of the after show party-goers!